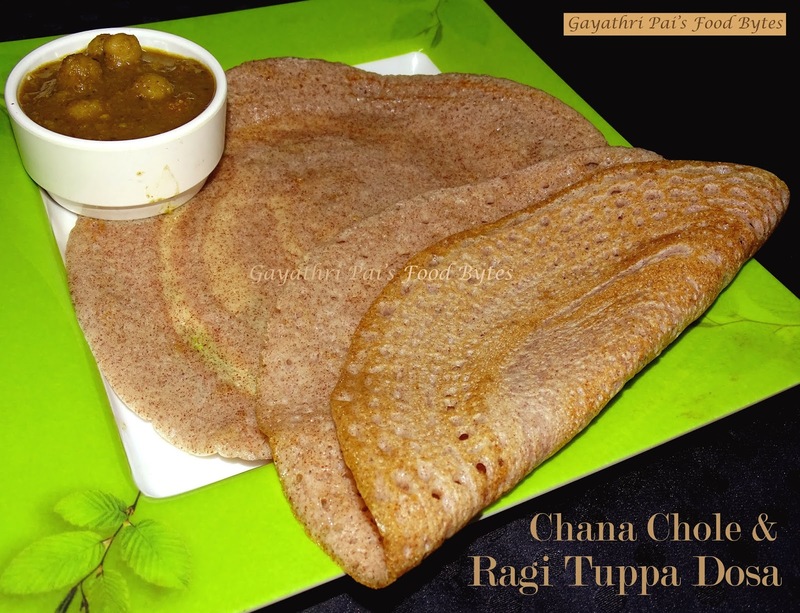 Gayathri Pai's Food Bytes: Ragi (Nachani/Finger Millet) Tuppa (Ghee) Dosa. “Ragi (Nachani) Tuppa Dosa / Finger Millet Ghee Dosa” served with Chana Chole … I prepared the dosa slightly thinner than the original tuppa dosa and fried it crisp on both both sides … A delicious dosa that tastes awesome when relished hot from tava with any spicy side dish of your choice … I served it with chana chole … Yummilicious …. ** I had already posted tuppa dosa which I prepared from my friend’s recipe over a month back. This time round, I prepared it with the addition of Ragi / Nachani / Finger Millet which is a healthier adaption as ragi is very good for health. The millet is getting popularity now, while we, south Indians have always relished it in one way or the other. The dosa is slightly thicker in texture unlike crisp thin textured dosa like masala dosa, but can be fried crisp on both sides. It tastes awesome when served hot from tava with any side dish or chutney too of your choice. I however serve the dosa many a times with any masala bhaji too which I have prepared for lunch or dinner. It not only saves time on again preparing chutney etc. but above all dosa does taste awesome with dishes like chole, pav-bhaji, missal, usal or even chicken curries and in my home we love to have it with a little bit of that gravy. So, I always make it a point to keep some if prepared for dinner or make the dish along with bf. So that I can serve it along with dosa. Try the combo, it taste awesome, you family and friends will simply love it. ** Here is the recipe to Ragi (Nachani) Tuppa Dosa / Finger Millet Ghee Dosa …..
** Sprinkle water over poha and make it wet so that the poha soaks in water properly and is mashed properly. Do not add in excess water, just enough to make it wet properly. Prepare this just before you start grinding for the dosa. ** Put washed and kept ready urad dal and rice in a mixer grinder or wet grinder along with the soaked methi seeds along with the water in which it is soaked and grind to a smooth batter with say about 1-2 cups of water. Please do not add in more water, you can always add on later if needed. ** When the batter has become smooth without any grains left add in the mashed poha and further grind till all the ingredients are well mixed and the batter turns to a very smooth consistency. Remove the batter in a large vessel, cover with a tight lid, and keep it to ferment overnight or for at least 8 hours. ** Note : Keep this a batter in a large vessel, as the batter rises on fermenting and the chances of overflowing are high. ** Next morning or after 8 hours once the batter has fermented add in ragi flour, salt to taste, sugar and beat the batter well. The mixture should become smooth without any lumps whatsoever. Keep this aside for 5-10 minutes, for the sugar to get melted. Now add in the cooking soda and mix well. The batter is now ready to be prepared into dosas. Remember the batter should be slightly thicker like that of Idly batter, so add in water only if necessary. ** Now, add a cupful of batter with a rounded spatula in the center of the tava and spread evenly into a round circle of about 8-10 inch diameter, just like how you prepare the masala dosa. Use light motion, do not press the spatula too much lest the dosa will tear. Also, see to it that the dosa is spread slightly thicker than masala dosa and thinner than the original tuppa dosa. ** Increase the heat to medium, add a tsp of melted ghee all round the edges of the dosa and let cook uncovered till crispy and evenly browned on the bottom side. Now add in about half a tsp of melted ghee on top of the dosa in drops and gently flip over the dosa with a flat spatula and gently press it down on the tava. Remember this dosa is fried crisp with ghee on both sides. ** Once the top side is flipped, all it tastes is about a minute or so to get crisp fried. Do not over fry or burn the dosa as it loses taste. Now gently remove the dosa and put it on a serving plate. Repeat the procedure with remaining batter and remove the required amount of dosas in similar pattern as mentioned above. The remaining batter should be put in the fridge in a large box immediately for further use later on or else the batter will turn sour. ** “Ragi (Nachani) Tuppa Dosa / Finger Millet Ghee Dosa” is done and ready to be served. You have to serve this ragi tuppa dosa hot directly from tava to plate or else it loses its taste. Best if served with any chutney of your choice. However, in my home we love relishing such dosas with spicy curry and I had prepared for lunch chole, so I served it with chana chole and it tasted yumz. You may serve with any spicy side dish of your choice too that you prefer. ** I had prepared the Tuppa Dosa / Ghee Dosa a month before and at that time I had written that I loved the dosa and would definitely try out some different versions of the same that were cropping up in my mind. Here is my one take off on the tuppa dosa and I am assuring you I will try more options still. Until then, try this out and enjoy with your family and friends and yes do send me a mail or leave in a comment of feedback if possible. Any suggestions are also welcome. ** I am also sharing the link of the Tuppa Dosa that was prepared a month back and I have written my “Thoughts and Notes” about it in that particular post, so I do suggest that for those of you who are new to Tuppa Dosa to click on the link given below and enlighten yourself about this dosa. The link is given below, do try out that version too, tastes awesome. ** For the “Chana Chole” Recipe, you can follow the following links and prepare either of it as per your family choice ….